Target Field officially opened on April 12, 2010 when the Twins hosted the Boston Red Sox. 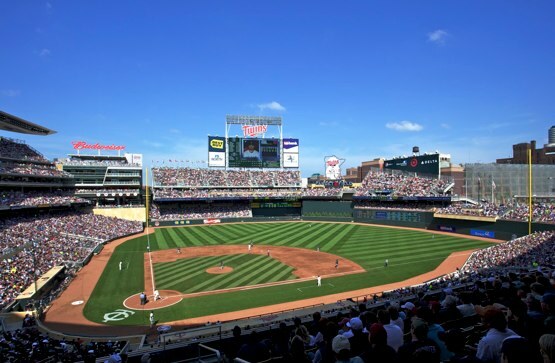 The ballpark is designed to provide fans with an outstanding venue to watch baseball and is a wonderful civic landmark for the city of Minneapolis and the entire state of Minnesota. Target Field features spectacular views of the Minneapolis skyline and superior sight lines from every seat. The total seating is approximately 40,000 with nearly half of all seats in the lower bowl. Target Field features one of the closest seating bowls to the playing field in all of Major League Baseball. It has approximately 18,500 infield seats. A unique seating feature are the wood-back seats located in select portions of the ballpark. Those types of seats have not been placed in any new ballpark since World War II. The idea is to connect the exterior color of the ballpark with the interior. Target Field features a 360-degree open main concourse giving fans an uninterrupted view of the playing field. The concourses are twice as wide as those in the Metrodome. The dimensions for the ballpark are 339’ to left; 377’ to left field power alley; 404’ to center; 367’ to right field power alley; and 328’ to right. The outfield walls are 8’ from the left field foul pole to right center field and 23’ from right center field to the right field foul pole. Target Field’s 2.5 acres of natural grass is a 4-way blend of Kentucky bluegrass. The sod was grown at Graff’s Turf Farm in Fort Morgan, Colorado in soil that was 90 percent sand to promote quick drainage and minimize rain delays. Before any sod was laid, crews in Minnesota had to build the foundation. They trucked in and leveled about 18,000 tons of sand, gravel and peat. Every batch of mix was tested for consistency so that the sod will grow evenly across the entire playing field. The precise formula was expertly designed to feed the grass and funnel away water. Target Field features an environmentally friendly design that incorporates conservation, sustainability and energy efficiency. The ballpark is among the most accessible in professional sports in terms of seating and access for fans with disabilities, exceeding nearly every state and federal regulation for persons with disabilities. For example, The Minnesota Ballpark Authority, the Twins, designers and disability advocates are particularly proud that every entrance to Target Field is accessible to those with disabilities. This design feature exceeds both Minnesota’s 60 percent standard and the federal government’s requirement that 50 percent of entryways be wheelchair accessible. Once inside, special design features bring disabled fans closer to the game. There are great sight lines that guarantee fans in wheelchairs won’t miss any of the action on the field. In addition, those who are deaf and hard of hearing can read real-time PA announcements on outfield captioning boards. There are also lower counters (34 inches) with braille and large print at all food and beverage concessions. This will make it much easier to grab a hot dog and soda. Transportation to Target Field includes light-rail transit, Northstar Commuter Rail, a Metro Transit bus hub at the ballpark site, the Cedar Lake Bike Trail and 20,000 parking spots within five blocks of the ballpark. There are 401 women’s and 266 men’s restroom fixtures in Target Field. In comparison, the Metrodome has 256 women’s and 192 men’s fixtures. One million total square feet with seating for approximately 40,000, which is comparable to Pittsburgh’s PNC Park and San Francisco’s AT&T Park. Target Field’s exterior is a modern interpretation of the state’s natural creations. Hearty, weather resistant, native Minnesota limestone forms the mass of the ballpark’s facade. Glass and metal details punctuate the limestone surface, creating a sophisticated composition. In addition, the ballpark and surrounding areas incorporated Minnesota-native flowers, trees and shrubs. Seats in Target Field are generally wider and have more leg room than those in the Metrodome. There are more aisles and fewer seats per row. In addition, on days when the weather is less than perfect, fans can take advantage of heated concessions, restrooms, restaurants and lounge areas found on each ballpark level. These areas will allow fans to still watch the game action in a comfortable, climate controlled setting. The ballpark’s canopy – one of the largest in baseball – provides added protection as well. All of the handles on the exterior gates are in the shape of the state of Minnesota. Pictures of players are highlighted in the signage on the concourse level. Hardwood murals of Kirby Puckett and Rod Carew are featured in atriums on the club level. A collection of all-time great lines from Twins broadcasts are etched in wood planks on the wall outside the radio and TV press box. The original flagpole from the old Metropolitan Stadium has been installed on Target Plaza. In addition, the celebration sign in center field features the original Twins logo from 1961. The logo is two characters dressed in old-time uniforms — one from Minneapolis and one from St. Paul — and whenever a Twins player hits a home run, the sign will light up, making it look like “Minnie and Paul” are shaking hands across the Mississippi River. The Minnesota Ballpark Authority (MBA) owns Target Field. The MBA was created by the 2006 Minnesota Legislature and charged with overseeing the design, construction, and operation of a new ballpark. The MBA partnered with the Minnesota Twins, Hennepin County, Mortenson Construction, Populous and HGA Architects on the construction project.